Need a comprehensive condition report but don’t want to spend a fortune? We can send an industry recognised RBI expert on the Sunshine Coast to inspect the property. They will zero in on any potentially expensive problems or, fingers crossed, provide a concise report that shows the property is sound. Feel free to be on-site during the inspection, watch our industry-leading experts work their magic, and at the end discuss any aspect of the inspection with the inspector directly. Your satisfaction is our aim. Is that house right for you? Our easy-to-read report will help you make an informed decision. After a detailed visual inspection of the property, the inspector will present his findings in plain English. Our comprehensive report will highlight all issues present, and potential future problems, in detail to help you avoid hefty repair bills down the line. Our reports follow AS4349.1-2007 and AS4349.3, meaning that they are fully recognised by your estate agent and lawyer. As experienced professionals with more than a thousand inspections under our belts in Queensland, nobody is better placed to advise you on the condition of your dream home. The property looks fantastic and the agent says it’s in great condition, but what might be hidden in the corners and behind the walls? Rotten wood, water leaks, termites – you might not be sure what to look for but our inspectors won’t miss a thing. Our highly-qualified inspectors will show you any issues that need repairing as well as problems that could cost you dear in the future. Your inspector will have all the tools of the trade to find those hidden horrors. With radar and thermal sensing equipment, RBI’s inspectors can literally see through walls, all in one GST-inclusive price. Other inspection companies might charge extra for these things, but with us, what you see on the first quote is what you get on the day of the inspection. There was a time when a pest inspection meant plenty of drilling and tapping to see what else might be living in your future home, but these methods were as unreliable as they were messy. With the latest technology available, we can detect any pest without pulling the house down. Radar technology plus thermal and moisture sensing equipment will look behind the walls, ceilings and floors and afterwards you’ll never know we were there. 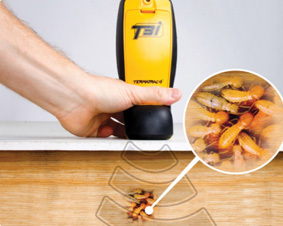 Our inspection team carries and is fully trained in the use of the Thermatrac t3i device – the only device that that can detect, locate and confirm the presence of termites with no impact on the building at all. Our reports highlight areas of concern, and point out hazards and defects that may need costly repairs. We also provide full photos and recommendations on the work required to rectify the issues. We’ve made sure that all reports are written in plain English, and prepared under current industry practice. Call ☏ (07) 5415 0080 to get a sample report. Our Sunshine Coast condition reports are prepared in accordance with Australian Standards and are recognised by real estate agents and solicitors. This means you can make your purchase decision with confidence, knowing the property has been thoroughly checked by Sunshine Coast experts. Why Choose Rapid Building Inspections in Sunshine Coast? Every inspector in our RBI Sunshine Coast area is a licensed builder and has operated under that license for at least five years. Which means they’ll be able to spot issues less experienced inspectors could miss. We never compromise on quality. Our inspectors follow the Australian best practice in pest inspection and are trained and qualified according to the Australia inspection standards AS4349.1-2010 and AS4349.3. We are authorised to conduct pest inspections on the Sunshine Coast. We are eager and active members of the IBC and regularly meet to improve our capability in building inspections, pest inspections and pre-purchase inspections reports. All our work comes with professional indemnity insurance of up to $5,000,000. This is how we give you peace of mind. Our devices can precisely detect, locate and confirm the presence of termites without needing to physically penetrate any walls, floors or ceilings and more importantly, it won’t disrupt or displace termite activity. All our expert RBI Sunshine Coast inspectors all use the Termatrac T31 and Tramex Moisture Encounter Plus. The updated Remote Thermal Sensor can pinpoint significant heat sources generated by termites within conventional building structures and the Termite Detection Radar accurately detects and confirms the presence of termites in the suspect areas. It can also find and locate termite nests and entry points. This device, using a specifically calibrated radar signal, this device can identify termites through timber, brick, masonry, concrete, plasterboard, plastic and other common building materials. No more holes in walls, and no need for tapping or prodding. And because the termites aren’t disturbed, they remain active for easy and accurate detection by the Termatrac Termite Detection Radar. The Termatrac T3i can identify potential termite risk areas by the concentrated presence of moisture in most surfaces including wood, drywall, roofing, plastic, brick and concrete. The Moisture sensor built into the single Termatrac T3i hand-held unit can measure and record differential moisture levels in building materials without damaging them. Our Sunshine Coast inspectors all use the Tramex Moisture Encounter plus(MEP)- a non-destructive overall building inspection moisture meter. Fast, precise and versatile. It can measure and evaluate moisture levels through paint, wall coatings, plasterboard, ceramic tiles, floor coverings, wood, roof coverings and ceilings. But just because we’re fast, doesn’t mean we compromise. Every report has to pass a stringent quality review from head office before it’s sent to you. We provide the most affordable inspections by having minimal face-to-face interactions between the RBI Inspector and the custodian of the property. We’re located in sunny Brisbane and service CBD, Northside, Southside and everything in between. Just give us a call and we’ll send over one of our Brisbane inspectors ASAP. What does rapid mean? Fast dispatch and a guarantee of not missing the appointment. You’ll have your report 24 hours after the inspection on your money back! When can you do the inspection? We will endeavour to make a slot available to you at the earliest convenience. We never turn work away. Do you check the loft and roof? As long as our inspectors are able to gain access. This is another way we provide best value Sunshine Coast Building Inspection. What is included in the report? 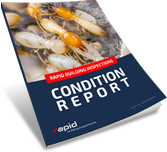 Our reports include a building report, pest inspection report and a findings area. And all in easy-to-understand English.